SellingRestaurants says if you're looking for value in the PB area look no further. This restaurant is turn key for current Mexican food concept and is just blocks from the shores of the Pacific Ocean. Minutes from Garnet Ave the location is close enough to capture business from the ultra popular strip yet has plenty of parking and patio dining to enjoy a great meal and a cold beer. This stand alone Mexican food shop serves outstanding food with large portions in one of the premier locations in San Diego. There are two sets of patio dining areas offering plenty of opportunity to soak up the California sun. Rent at only $3,000/month is a bargain in this area. 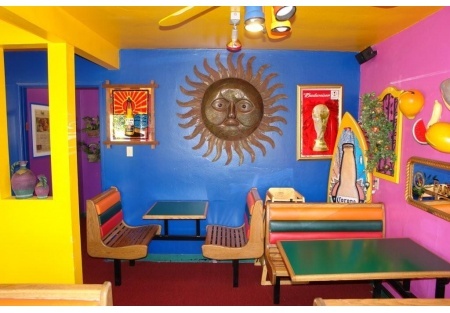 The decor is authentic Mexican creating fun atmosphere for all. Currently open 10am-8pm the location could substantially increase their sales by extending their hours. Ideal for a breakfast cafe and late night Mexican food both, this place could be a gold mine with longer hours and the right owner/operator in place. Please click on one of the orange buttons below for more pictures and information. This is a Stone Path Brokerage Services, Inc. DBA Selling Restaurants San Diego listing.